Silverstone - Italy's Andrea Dovizioso won the British MotoGP at Silverstone on Sunday and usurped Marc Marquez atop the riders' standings after the Spaniard's race was ended by a mechanical problem. Dovizioso nipped in front of pace-setter Valentino Rossi with three laps to go to win his second race in succession after the Austrian MotoGP, with Rossi finishing third behind Maverick Vinales. Dovizioso moved nine points clear of defending champion Marquez, whose race ended amid a plume of smoke from his Honda on lap 13 when he was running third. "I pushed 100 percent the last two laps," Dovizioso told BT Sport. "I wasn't faster, but I put my bike in the right position and was able to win the battle with Maverick. "This is an important victory. Leading the championship, thank you to the team." Marquez started on pole for the fourth race in a row, but Italian veteran Rossi, racing his 300th MotoGP race, darted past him to take the lead going into the first corner. Dovizioso and Vinales's attempts to chase Rossi down were initially compromised as they jostled for position with each other, before Dovizioso finally managed to put the Yamaha man behind him. Marquez also moved past Vinales, only for his bike to betray him as he looked to chase down Dovizioso. 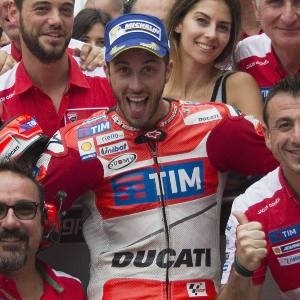 Dovizioso's superior speed made it only a matter of time before he overtook Rossi. He duly stole past his countryman on Hangar Straight with three laps to go before holding off Vinales to claim his fourth win of the season.